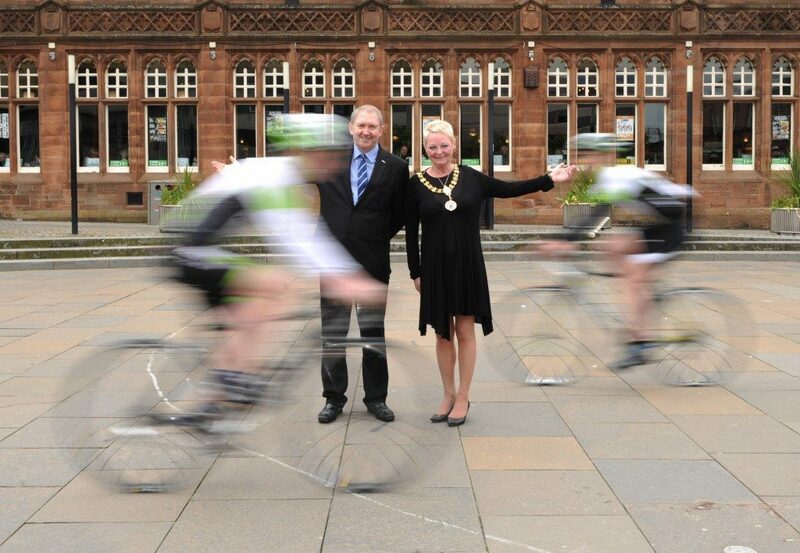 Renfrewshire sports fans can expect some high-speed, high-intensity cycling action in the heart of Paisley thanks to an exciting new event on its way to the town. Paisley has just been announced as the only Scottish date for the StreetVelodrome series, an all-action televised track cycling event set to tour the UK. Saturday 26 July will see an outdoor velodrome set up in County Square, around which amateur riders will be able to race against the clock. Those taking part will receive coaching from professional track cyclists – with the fastest riders getting the chance to compete for a place on the podium at the end of the day. The event will be televised around the UK and abroad, with action from the day set to feature in a dedicated programme to be broadcast on Channel 4, Sky Sports and Eurosport, putting Paisley in the spotlight. 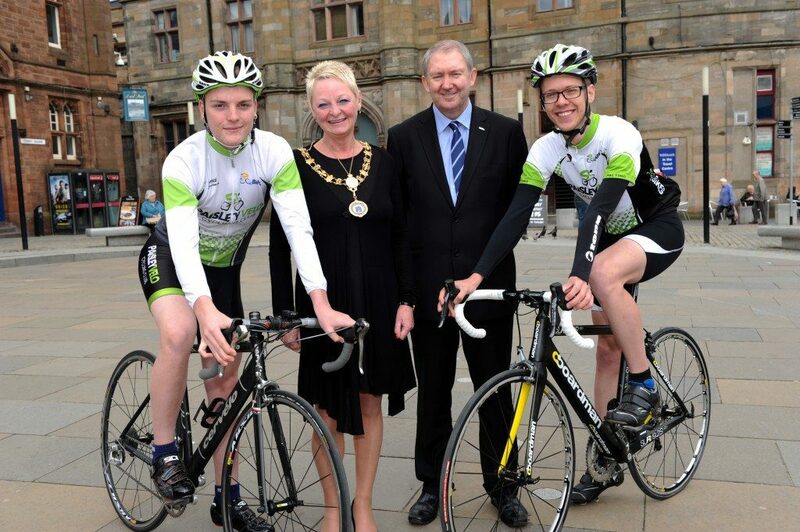 Renfrewshire’s Provost Anne Hall and Councillor Jim Harte, Convener of the Sport, Leisure and Culture Policy Board, met teenage cyclists Stuart Parker and Karl Bewick, from the youth section of the Paisley Velo club, to help promote the event. Councillor Harte said: “This event will take place during the first week of the Commonwealth Games, at a time where track cycling and Scottish sport in general will be enjoying an international profile. “It also means there is now a strong sporting theme running through the council’s increasingly-busy programme of town centre events. Provost Hall added: “The council’s growing collection of events means there will be loads going on over the summer to bring people into our town centres, with all the benefits that brings for businesses. Willie Cosh, team manager of Paisley Velo, said: “Paisley is at the centre of Scottish cycling right now – we are Scottish team time-trial champions and one of three top teams based in the town. Series Director Carl Thompson says “StreetVelodrome are very proud to be coming to Paisley, particularly at a time of heightened interest and profile for sport in Scotland. “We’ll be working closely with Renfrewshire Council to bring an exciting and entertaining cycle sport event right in the centre of town which will appeal equally to both participants and spectators. 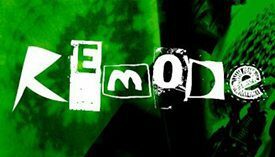 For full details about the event and to register online, please visit www.streetvelodrome.com. Entry costs £22 for senior riders (aged 24-plus), or £12 for juniors (aged 14 to 24).